Does the Bible Answer Man have to be an Evangelical Christian? Although CRI also has a magazine, a website, books and other publications, its primary mode of communication is through a very popular radio program called The Bible Answer Man, hosted by Hank Hanegraaff (Hank). Hank has hosted the program for about 25 years. You can tune into the Bible Answer Man on about 100 radio stations across the country. Most, if not all of the top Evangelical and Reformed Christians in the U.S. have been welcome guests on the Bible Answer Man and Hank has enjoyed wide acceptance across most of the non-Catholic, Christian world. Hank is not merely the radio show host, he also serves as president and chairman of the board of CRI. 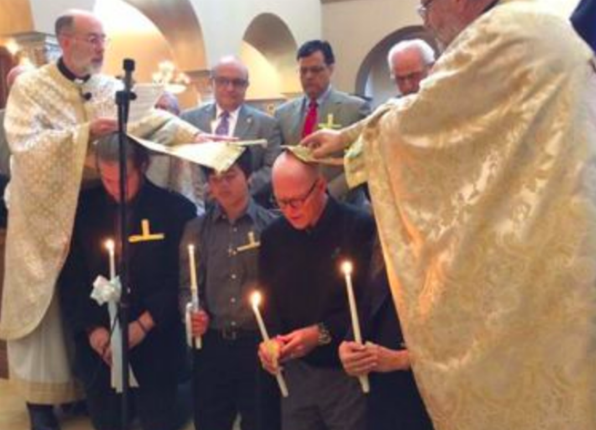 But there is a big problem now at CRI, because Hank has converted to the Eastern Orthodox Church. This is a problem because many of the beliefs promoted by CRI conflict with many teachings of the Eastern Orthodox Church. Sola Scriptura: Scripture is the sole and final authority on all matters of faith. Scripture and Tradition work together to serve as the final authority on all matters of faith. You are saved by faith alone. You are saved by grace working through love. Once you are saved, you cannot lose your salvation. You can lose your salvation after being saved, so the sacrament of reconciliation is a great thing. Imputed righteousness Grace is infused in baptism. Sacraments are at best, symbols & unnecessary with regard to your salvation. Sacraments actually give grace and are necessary for salvation. As you can see, Hank’s beliefs have now changed considerably, and this has caused extreme distress for some Christian apologists such as James White and numerous Evangelical Christians. You see, some people believe that the Eastern Orthodox Church is almost as bad as the Catholic Church. Many of these people believe that if you belong to the Catholic or Orthodox Church and actually live what these faiths teach (which is kind of necessary in order to actually belong to them), and you don’t repent (which in this case means you refuse to deny the teachings of Catholicism or Eastern Orthodoxy), you will end up in Hell. I’m writing this less than 7 days after Hank’s entry into the Orthodox Church. Since that time, numerous articles have been written, many of which claim that Hank has left Christianity (and is therefore presumably on his way to Hell) and others, though less damning, are very displeased with the loss of a well-known personality to a more Catholic form of Christianity. James White has spent nearly 3 hours of his broadcast, criticizing Hank. But in order to do so, Dr. White had to frame the issue improperly from the very start. In his broadcast bearing the title: Can a Consistent Eastern Orthodox Believer Be the Bible Answer Man?, which aired on April 13, 2017 (5 days after Hanks’s conversion), White started his argument (at about 8:35) by saying, that by calling yourself The Bible Answer Man “The presupposition of it is that the Bible is the final source of the answers for the questions that you are going to have about the Christian faith”. White gets is wrong, right off the bat. He tries to hit it into the gap, but he ends up with a foul ball. Eastern Orthodox Christians use the same Bible that White uses and can point to the very same Scripture verses to answer questions that come up. The main problem with White’s “presupposition” is that the Bible is not the final source, it is an essential and very important source, but so is Apostolic Tradition (a.k.a. Sacred Tradition). Scripture, Tradition and Authority as guided by the Holy Spirit all combine to provide us with the “final source”. The second flaw in White’s “presupposition” is that only certian Christians can provide biblical answers. White should have titled his show: “Is a member of the Eastern Orthodox Church immediately disqualified from hosting a radio show called ‘The Bible Answer Man’?” No. Of course it would be a much better show if it were hosted by a gifted Catholic, but White would hate that even worse. Regardless, Hank can continue to host the show and he can continue to call himself The Bible Answer Man. In fact, he is now more qualified to do so than he used to be because he clearly has a better understanding of Scripture, Apostolic Tradition and Church history than he possessed when he started with CRI. This is why he is now closer to Catholicism than he used to be. It is unfortunate that he has only gone as far as the Eastern Orthodox, but for many Evangelicals and other non-Catholic Christians, the Eastern Orthodox Church is an easier move because they can still reject the authority of the pope, Purgatory and some of the other teachings of the Catholic Church. However I suspect that Hank may eventually come to understand these things as well, and if so, he’ll likely convert to Catholicism and in doing so, find himself in the fullness of the truth. But that isn’t the key point here. The key point is that James White and others are openly criticizing (some are condemning) a man who one week ago, was perfectly acceptable to the great majority of non-Catholic Christians. Many of these critics want him to leave CRI, step down as the host of the radio show, leave the practice of Christian apologetics, etc… And in the end, these things will all probably happen. They will happen, not because Hank is incapable of doing his job, but because Hank’s funding sources will dry up. I suspect that within the past week, he’s received a number of personal notes from friends, family and financial supporters, who have either informed him that he’s seen the last of their financial and moral support or that they are in the process of stopping their automatic bank debits to CRI. Radio stations are in the process of curtailing their broadcasts of his radio show and subscribers to CRI’s magazine and other resources are being encouraged to cancel. This is the judgment of men in the age-old process of shunning. Hank has been tested and found wanting, and it has been a very quick trial. For some, they will remain affiliated with Hank only as long as they are contractually obligated to do so. Thankfully God doesn’t follow the same judicial process as men. The condemnation of his soul which has been predicted by some of the Evangelicals is nothing more than bitterness at losing one to the other side (which they think is the dark side). For some reason, they now believe they have the gift of judging souls, or at least former Evangelical Christian’s souls. So what led to Hank’s conversion from Evangelical Christianity to Eastern Orthodoxy? It was China. Yep. China has been one of the most long standing opponents to Christianity the world has ever known, but it was the Chinese people who showed Hank what a relationship with Jesus really looked like. He says that one man inspired him by saying, “truth matters, but life matters more”. Hank recalls that on the flight back from China, he compared his intellectual knowledge to the “experiential” love the Chinese Christians had for Jesus. When Hank saw this, he began to wonder if he was actually Christian. Because of his experience in China, he began researching the early Christian Church and found that the Eucharist allows him to experience a much deeper relationship with Christ than he was able to experience through Evangelical Christianity. Hank wanted the experience and used his gift of intellect to help him get there. Like so many before him (John Henry Newman, Scott Hahn, Steve Ray, Fr. Richard Neuhaus, etc…), this process led Hank to the Sacraments, most especially the Eucharist. For most non-Catholic Christians, the journey home begins with the desire to have a deeper relationship with Jesus Christ. In their non-Catholic tradition, they are limited in how deep they can go and while their relationship is often very rich and fulfilling, they can never experience the relationship to the depth available through the sacraments, meditative and contemplative prayer and Eucharistic adoration. On top of this, they have commonly been taught to fear or at a minimum, be skeptical, of the beauty of the Catholic Church. Architecture, stained glass, imagery, statues, candles, incense, vestments, music, prayers for the deceased, saints and many other aspects of Catholicism are demonized and distorted in an effort to make them seem unappealing. This keeps many non-Catholic Christians from realizing that a deeper relationship is offered through the Eucharist, but some, like Hank, have been able to see past the deception. Those who convert to Catholicism are also demonized and portrayed in a negative manner. And when you are a nationally known Evangelical, even converting to the Eastern Orthodox Church is cause for vengeance. Those who are criticizing Hank ignore the fact that he hasn’t walked away from Scripture, nor has he placed anything above Scripture. He’s simply recognized that the Church preceded Scripture and it is only due to Tradition that we now have Scripture. This is the very best example of Scripture and Tradition being of equal importance in Christianity. To say they are not equal would force you to say that Tradition was not only prior to Scripture in time, but importance as well. Such is not the teaching of the Catholic Church and such should not be the belief (explicit or implicit) of any Christian. The fact is, when Scripture and Tradition are properly respected, they work together to open up a much richer and illuminating relationship with Jesus Christ. As you can see, I took the title of James White’s broadcast and flipped it around a bit. Dr. White asked, “Can a Consistent Eastern Orthodox Believer Be the Bible Answer Man?” and I ask if the Bible Answer Man has to be an Evangelical Christian. Dr. White’s flaw is that he presumes that one must believe that Scripture is the final authority to answer questions regarding faith. He’s wrong. While one can answer many questions through Scripture alone, the most complete answers can only be provided by a combination of Scripture and Tradition. Of course Dr. White knows this, because he frequently refers to non-biblical sources in an effort to answer questions on matters of faith. He does so with great bias against the Catholic (and Eastern Orthodox) Church, but he does so nonetheless. Even though I predict the rather sudden end to CRI and the Bible Answer Man radio show, I do wish Hank the best in his journey of faith and would love the opportunity to sit down with him someday and help him recognize and appreciate the teachings of the Catholic Church.